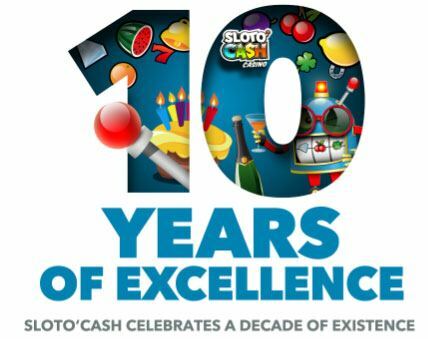 Sloto’Cash celebrates a decade of existence! This year Sloto’Cash completes a full decade of operating at the highest level. Our brand was developed with the ambitious goal of becoming a leader in the online casino industry. In 2007 it was launched through the emerging platform of Rival software. It was then a new casino software less than a year old and Sloto’Cash made history by becoming the number 1 Rival-powered casino of its time, able to compete against all the older and bigger casino software companies. Later in 2011, the Sloto’Cash team decided to go for bigger and better things and switched to RTG’s casino software. While making the switch, Sloto’Cash hired Stephen Vaughn, a renowned online casino manager with many years of experience. His expertise, care and dedication have only added to the value of our brand. Over the last 3 years, Sloto’Cash has grown significantly while maintaining its reputation as a professional, friendly and fair online casino. With the release of SlotoMagazine, SlotoShop, SlotoWorld and other original initiatives, our brand has become a contender for the title of being the top RTG casino in the world. We want to thank all of you, our customers, for keeping the Sloto’Cash dream alive. Thanks to you we continue to manage a reputable operation that believes in responsible gaming for the adult community. We promise you that we will keep our high standards in the future and provide you with a safe and reliable site for your online casino bets.